Haga click en la imagen / Click on the image to view. Integrante del Club de Grabado desde 1961 a 1965. Desarrolló un estilo propio de la figuración. Vivió en Europa desde el año 1966. 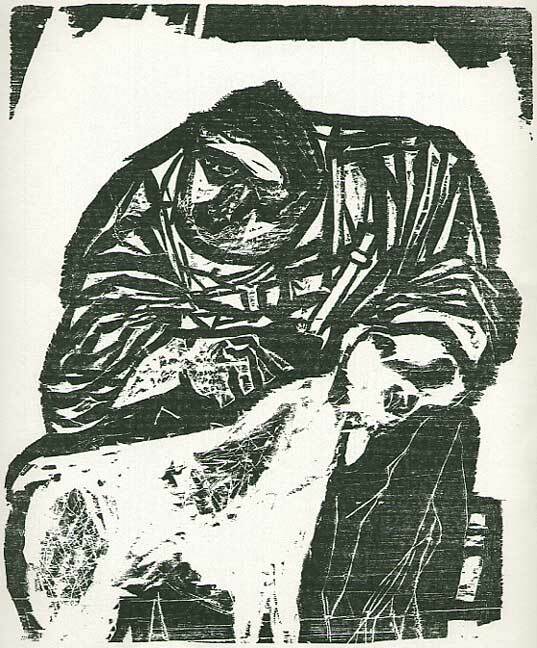 Member of the Prints Club from 1961-65, where he developed a distinctive style of figural printmaking. Lived in Europe after 1966. Artista autodidacta que retrató a la gente de la clase media. Una de sus pocas obras en pequeño formato. Mostly self-taught artist who usually took middle-class persons as subjects. He preferred to work in large format; this is one of his few small works. Profesor en el Club del Grabado por muchos años, estudió con Pedro Figari en su juventud. Retrató a cosas típicas urguayas. 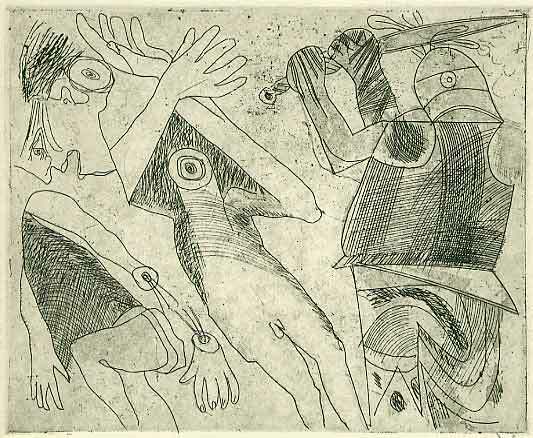 Long-time teacher at the Prints Club, he studied with Pedro Figari in his youth. 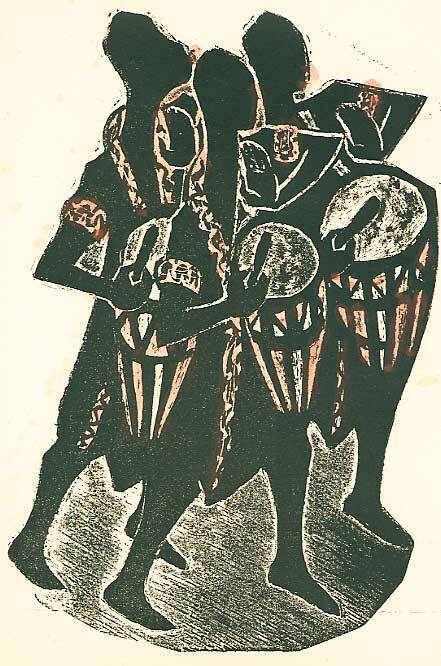 Usually depicted "typical" Uruguayan subjects, in this case Afro-Uruguayan performers of Candombe. Fundadora del Club del Grabado en el año 1953. 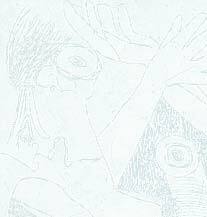 Este grabado conmemora al primer estudiante asesinado por el gobierno, semanas antes de la imposición de la dictadura militar. El nombre de la obra proviene de la novela de W. H. Hudson Tierra Purpúrea. Se fue al exilio en el año 1976. Founder of the Prints Club in 1953. 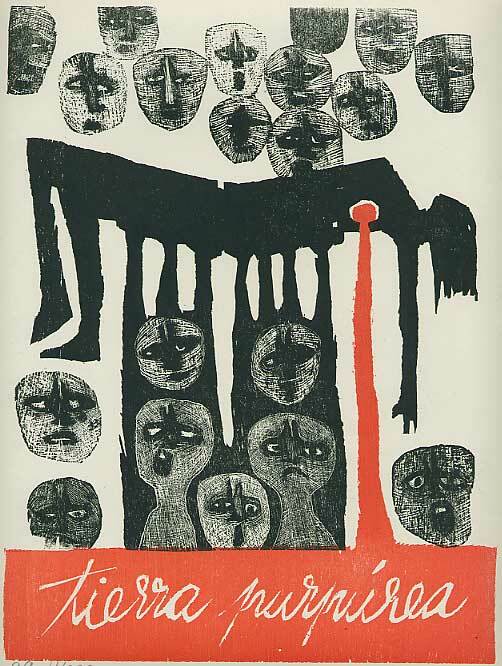 This work commemorates the death of the first student protestor, just before the imposition of the military dictatorship. The title comes from the novel The Purple Land by Henry Hudson. The artist went into exile in 1976. ". . . Sobrevino Completa Ruina" / ". . .Complete Ruin Overtook Us"
Exilado en el año 1974, unos meses después de exponer esta obra, que forma parte de una serie que denuncia la imposición de la dictadura. La mano cortada de la figura alude a la muerte del cantante Víctor Jara. 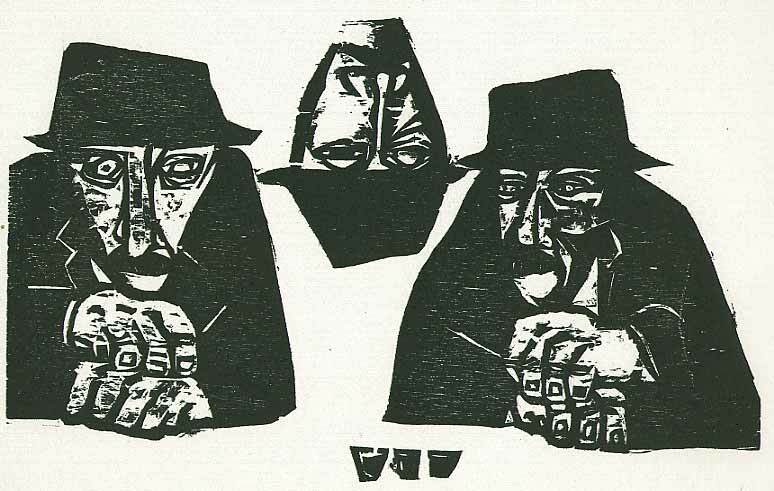 Exiled in 1974, a few months after exhibiting this work, which comes from a series which condemns the imposition of the military dictatorship. 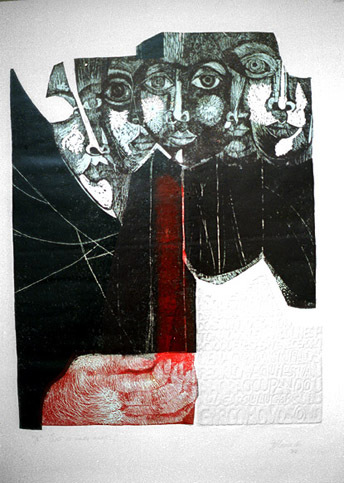 The severed hand in the work alludes to the death of Chilean protest singer Victor Jara. Esto Es Nada Más. . . / This Is Nothing More Than . 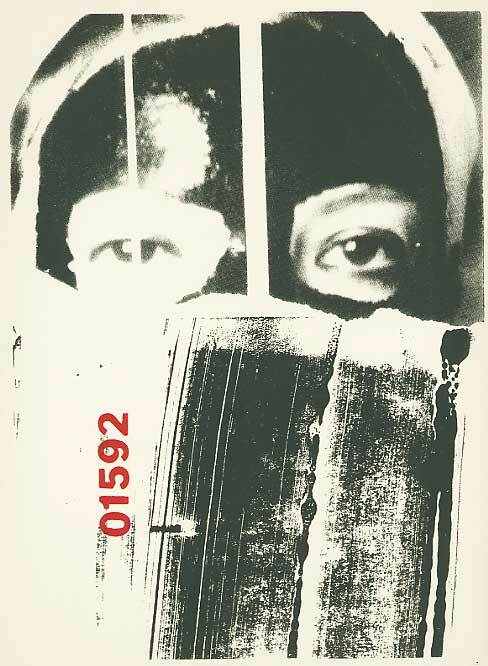 . .
Long-time member of the Prints Club, her calendar for 1974 was censored by the police, setting off the reorganization of the Club under the dictatorship. The present work contains a text of words run together which reads something like this: This is nothingmore thanaheap ofwordsandbeings alltogetherandpile dupfillingasp acewhichbelongstothembe causetheywerebornw ithoutchoosingthisthems elvesandhere theyaretogetheroccupying aplacetheirplacetheirp lacejustlikeyouandme. Integrante del Club del Grabado en los años de la dictadura, su estilo demuestra la evolución del Club hacia la serigrafía y hacia temas más imaginativos. 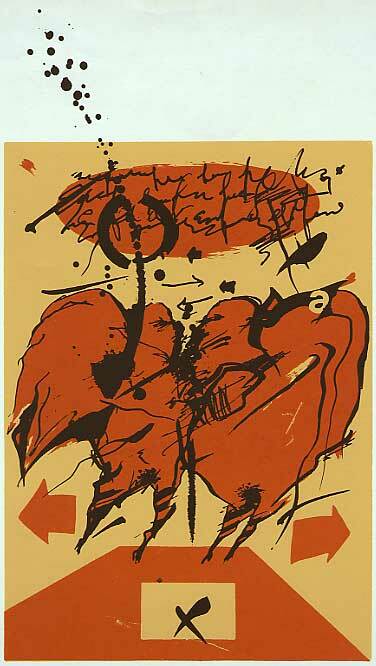 Member of the Prints Club during the dictatorship, his style shows the group's evolution toward silkscreen and toward more personal, expressive subject matter. Integrante del Club del Grabdo en los años de la dictadura. En su obra se nota alguna relación con el postmodernismo de la apropiación de imágenes. Empezó a pintarse para después fotografiarse. Member of the Prints Club during the dictatorship, her style shows some relation to postmodern appropriation. She made prints from self-portrait photographs after painting her own face. Director del Club del Grabado durante la dictadura, se tuvo que encargar de la adecuación de la producción del Club a los dictámenes de la dictadura. Cultivó un estilo algo irónico en su obra. Director of the Prints Club for most of the years of the dictatorship, he was in charge of keeping the production of the Club out of trouble with military censors. 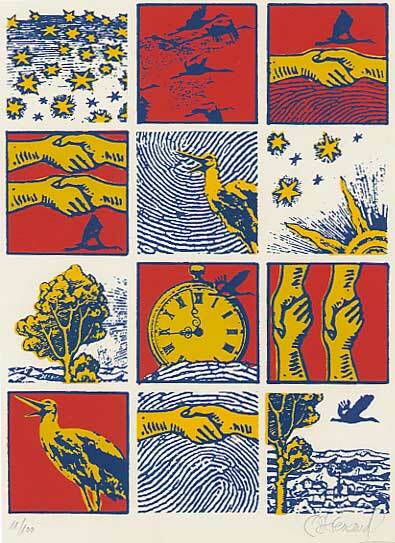 He developed an ironic style in his own prints.